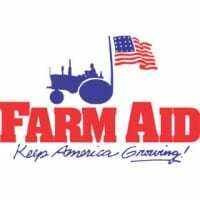 The 25th Annual Farm Aid concert Farm Aid 25: Growing Hope For America, will take place Saturday, October 2 at Milwaukee’s Miller Park. Scheduled performers include Farm Aid President Willie Nelson, board members Neil Young, John Mellencamp and Dave Matthews (with Tim Reynolds), as well as Norah Jones, Jamey Johnson, Jeff Tweedy (of Wilco), Jason Mraz, Randy Rogers Band, the BoDeans, Band of Horses, Amos Lee, and more. Sirius XM listeners will be able to catch the concert live on Sirius XM channel Willie’s Place (Sirius ch. 64 / XM ch. 13) starting at 1 pm CT. Sirius XM’s Dallas Wayne will be on hand to offer backstage interviews and behind-the-scenes coverage.